As it "pops" from the toaster, it smells just like apple strudel. You can already imagine it tasting exactly like the crumb-topping apple strudel that's pictured in the lower corner of the box. You eat it. It's delicious. The apple flavor is more like grandma's apple pie filling than the apple flavor you usually get from toaster pastries. The sugar drizzle topping adds a welcome near-crunch to the warm doughy pastry. If you like the taste of warm apples, I can almost guarantee that you will like these Pop-Tarts. The first bite that I took... I thought I sensed a butter flavor in the pastry casing that I'm not used to in other toaster pastries. Granted, the taste is best described as "apple strudel Pop-Tart" flavor, as opposed to simply "apple strudel" flavor. You can't take the "Pop-Tart" out of the Pop-Tart. There are certain compromises that have to be made when you're trying to fit the flavor of a 2-inch favorite into a 1/4 inch pastry. As far as choosing Pop-Tarts for breakfast, there are a million healthier options I'd recommend instead. But Kellogg's - the only real super player in the toaster pastry game - has made great strides in making their Pop-Tarts healthier. These Pop-Tarts are made with "enriched wheat flour". Certainly, heath nuts would rather see the words "whole wheat", but give Kellogg's some credit. There's 0 grams of Trans Fat. The 3 grams (15% daily allowance) of Saturated Fat raised my eyebrow, but as once-a-week breakfast treat, I say go for it. It's a good product. 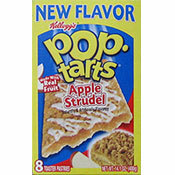 What do you think of Apple Strudel Pop-Tarts? I am about to taste these right now... based upon what u have all said I'm pretty sure I will enjoy these... I will check back asap with my conclusion. Anytime I see these poptarts I must buy. I am going out to buy some right now. My Children like pop tarts a lot but all of your frosted ones have gelatin in them. Can you please make them with kosher gelatin. I just wanted to comment on the Apple Streudel Pop-Tarts as well. I am not a big fan of Pop Tarts, but I have been buying this flavor of them every week since I first tasted them. I enjoy the taste & they are so simple to take with you on the go!